Tom Morello Demonstrates Effects- Why Not? 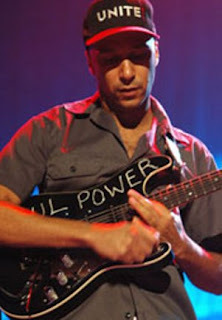 If anyone can demonstrate effects it's Tom Morello. Morello is an interesting guitar player with interesting approaches to creating sounds and utilizing effects. Anyone who writes "SOUL POWER" across the front of his Strat is on the our side. Formerly with Rage Against the Machine and Audioslave, Morello is also known for his solo acoustic folk gig called The Nightwatchman. Now that's a spectrum of work. A cool GW Tom Morello clinic video is posted in 2 parts. Tom explains his effects chain, and demos many of his techniques in detail. This can be inspirational stuff for anyone in a rut whose toys are gathering dust. Tom applies his imagination. The vids below originate from Guitar World Magazine. So make sure to also go there and subscribe to their very fine publication!!! GuitarGearStores.com for tons of hard to find & top FX pedal brands!